Having worked with Roberts Bakery for many years, we were asked to produce some creative food advertising concepts to promote the new items in their bread product range. One of Roberts Bakery’s unique selling points is the brand’s heritage – they have been baking since 1887 and have remained a family-run business in all that time. They command a great deal of local respect and support because of this, and it was important to convey this within the food advertising designs. 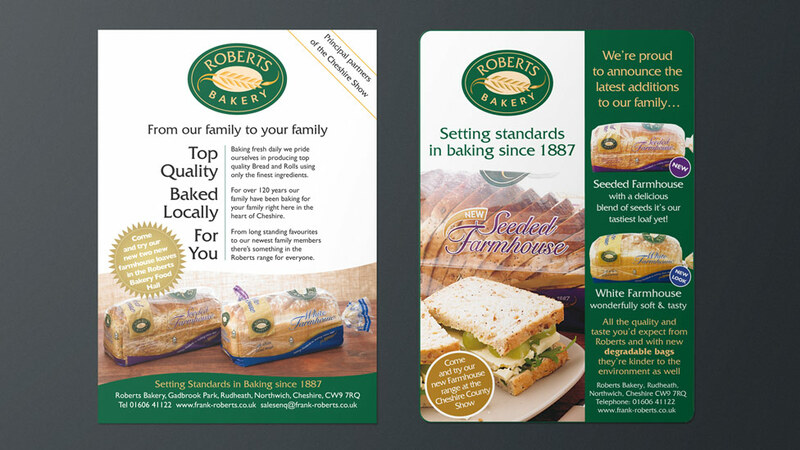 Bright, bespoke product photography combined with the distinctive typeface and colour scheme of the Roberts brand were the basis for the layouts. Calls to action encouraged readers to visit the company’s Cheshire Show stand.